One of my favorite video series of the original Painting Pyramid campaign was the set I created for color theory... on 5 colors. These were the 5 colors which I was asked so many questions about! That included Reds, Blues, Yellows, Greens and even Grays. 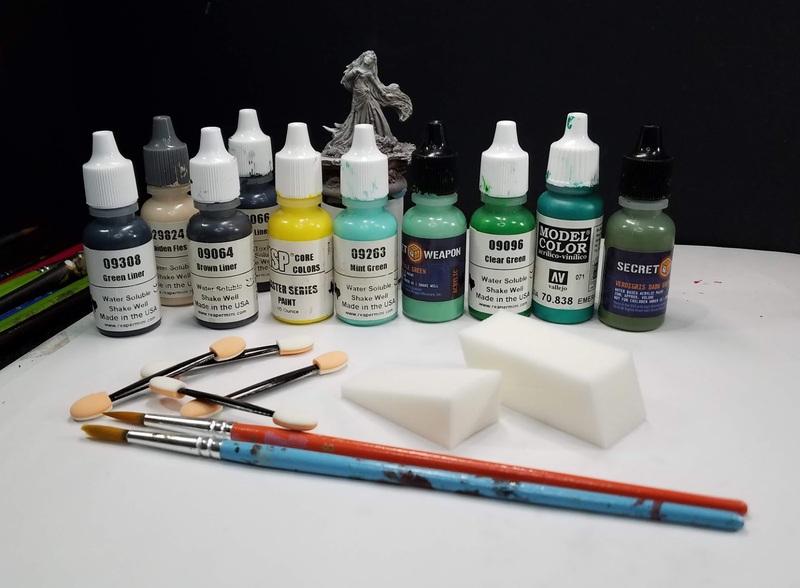 I thought it might be interesting to combine my new Dark Sword painting tutorials with one of these color theory specific episodes... and this time it was green! Here's the original swatch set that I painted during the older "Green With Envy" video. 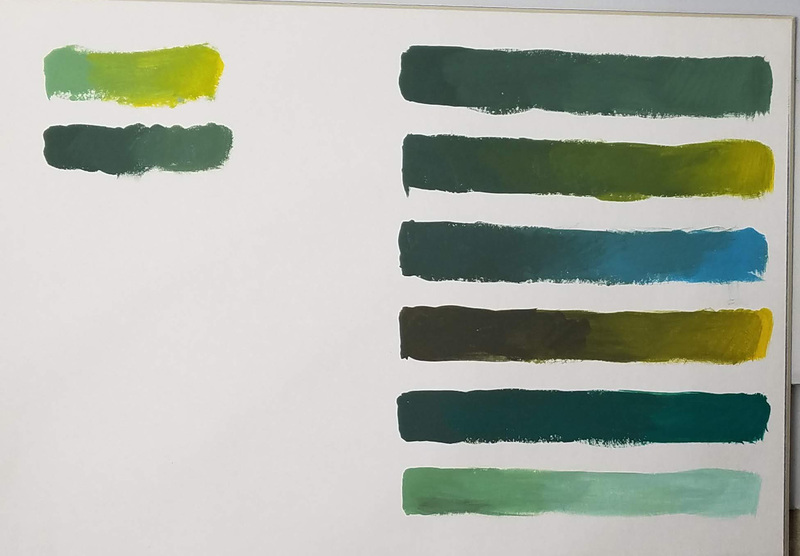 The idea was to show how you can create a rich and full set of light and dark, cool and warm, as well as saturated and muted versions of "Green". While nearly all of the colors that I used in that first video are probably gone now, it was so interesting to see that I had replacements for all of them for this new version. 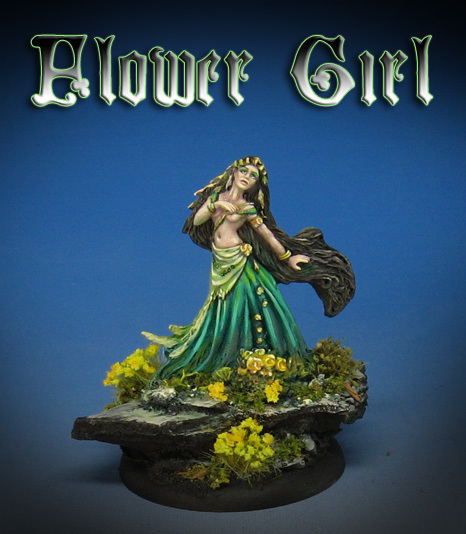 I wanted to take things a little further this time, including the basing as part of that color theory. Not only painting the base, but even what colors and types of foliage were chosen. 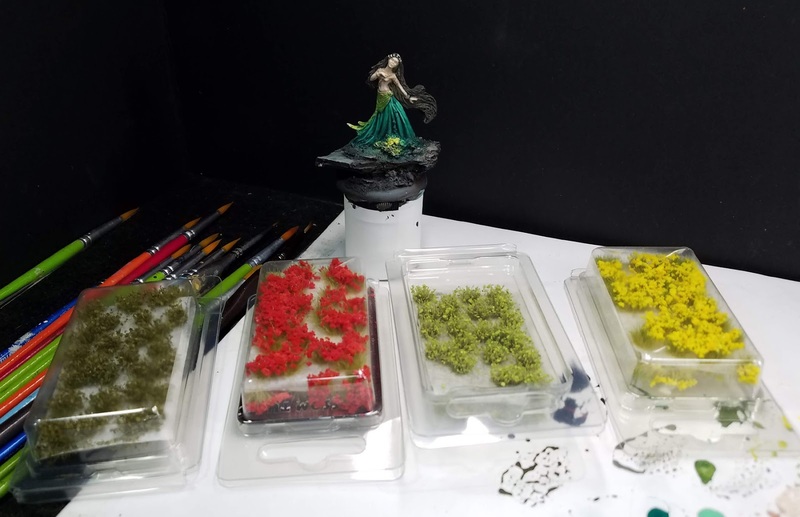 I had four different flower and shrub tufts from Green Stuff World, and choosing which ones to go with was a major part of the process. 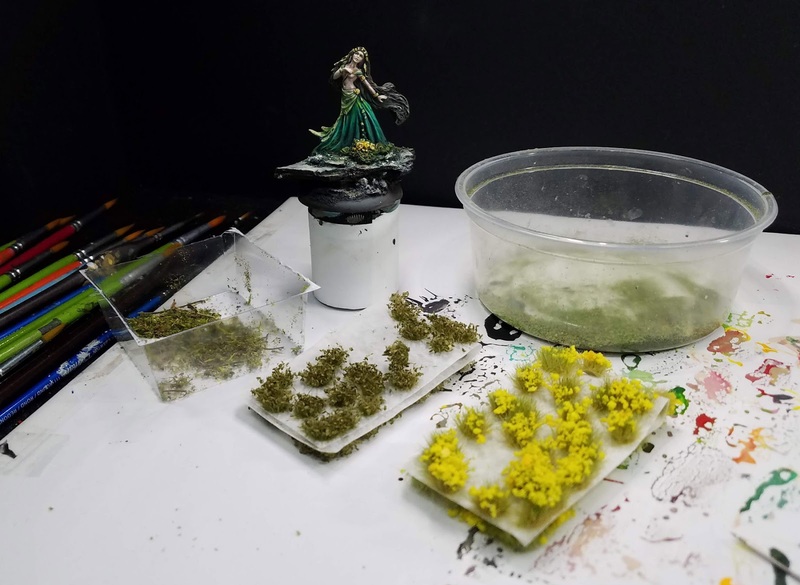 As usual, I go through the Shaded Basecoat and glazing techniques, showing how to mix that wide variety of greens along the way. Then it came time to choose the foliage. Early on I decided to go with yellow, and how that could still contrast with my greens, even though red is the natural "opposite". It seemed like a great way to show a new way to think about the flocking of a base. Normally I apply the shrubs and other tufts at that "end point", but this time I made the choice very early on, and painted specifically to that choice. Here is the result, with many course corrections along the way. This is something I try to show in every video that I film, so that people become less worried about making changes to their figures as they paint them. 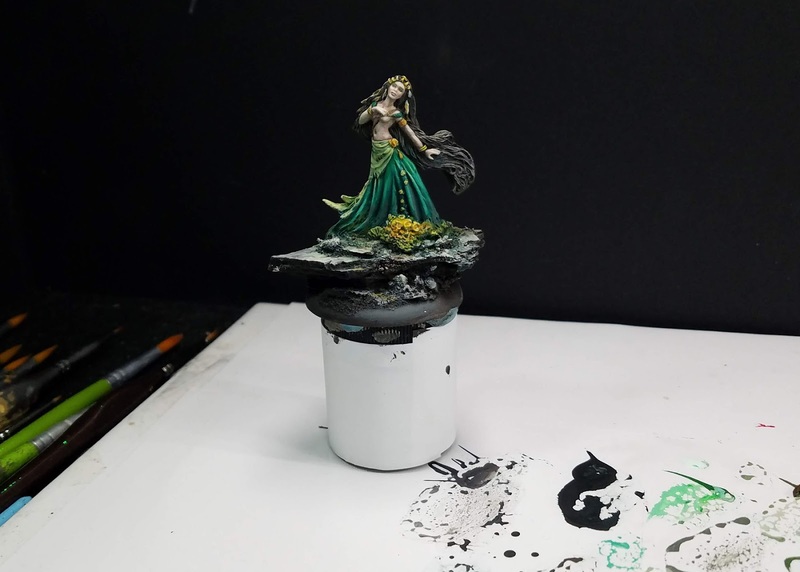 Since I use the Shaded basecoat and Glazing techniques as opposed to heavy amounts of layering, flipping around a color scheme does not take long, and I don't have to worry about "messing up", as I don't have countless hours invested in layering up one tiny area. I also stress moving around the figure, and not getting bogged down in one place. It is so important to maintain that global view of the figure, and provide the proper context. That is, if you only paint the face next to a lot of white or black primer, your skin tones will be radically affected. Once you place a dark blue next to that face painted next to white, you skin tones will look quite odd! The Dark Sword video series is $10, and you will see all the videos that pertain to the painting of those figures, as well as the other videos that a $5 pledge would bring in. That is usually about 8-10 hours of videos each month.